Konichiwa from Tokyo! After our awesome hitch-hiking experience from Shimoda to Tokyo, we didn’t think Japan could get any better. Well, let me tell you haha. 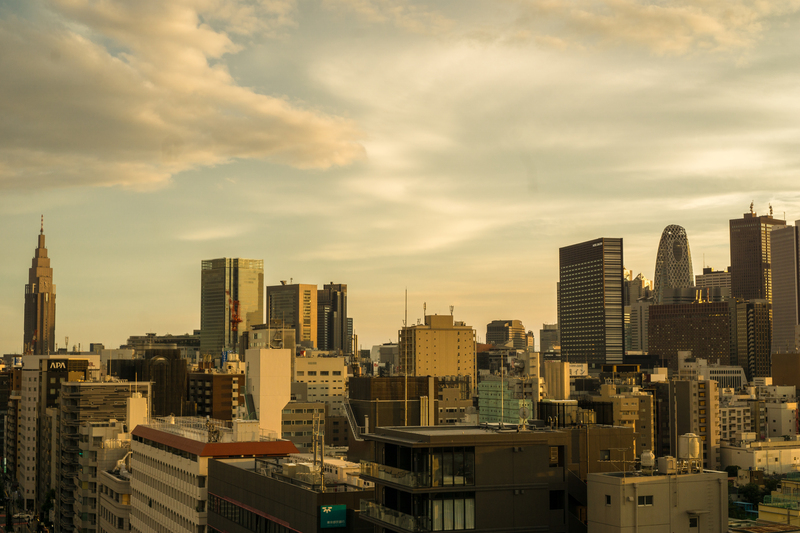 We farewelled our drivers and jumped on the subway to the heart of Tokyo – Shinjuku. I’m not actually sure if it is the heart of Tokyo but it feels fairly central to everything here. Eb and I can navigate our way around anywhere, after all, we did cycle through Europe! But man, navigating our way through Shinjuku subway was quite a headache. On top of navigating our way through the hundreds of thooooousands of bodies, we we struggling to find our exit, or any exit for that matter. We were lost in the subway for a good 30-40 minutes. After finally finding an exit, we started making our way through the bright lights of Shinjuku, on the way to our hostel. It was just amazing to see how many people there were, and how bright the city is at night. We were told that Tokyo is one of the only cities in the world where you can read a book at night. As we were walking to our hostel, we were taking note of the many styles people were rocking on the street. We would see the high roller classy look, the futuristic look, the punk rock look and the girls who dress up like dolls. They have most likely had plastic surgery for their eyes, as their eyes are so large and round. The hair styles here are something else too. One thing I really love here are the taxis, they are so pimping. They have lots of different coloured taxis which are immaculate and the drivers wear suits with white gloves too. Even the doors open and shut automatically. Before arriving to Tokyo, Eb and I emailed a bunch of hostels and asked if we could work in return for food and accomodation, because Tokyo is sooo expensive. We got a few replies that said yes, which was awesome. So when we finally made it to our hostel, we introduced ourselves and then the manager said, “My boss, just stepped out for dinner, you guys can go and join him”. How cool! We had the awesome hitchhiking experience and now we were being treated to a night out with someone we haven’t met! The boss shouted us to a delicious Korean meal with lots of drinks too. We were then taken to our room, which was located 400 meters away from the hostel. It’s an Air B&B apartment that they use as a back up room for the hostel, which is located on the 12th floor. We had the whole apartment to ourselves, for free! Just to recap: we travelled 150+kms by hitchhiking, were treated to lunch, a trip to the museum, then when we arrived in Tokyo, we were treated to dinner, and were given our own apartment… all of this, for FREE! Good karma was finally looking out for us. We are so appreciative of of all this. In return for this, Eb and I make the beds for the hostel, which is super easy. They have just over 100 beds, but each day we clean no more than 50 beds. We work for around 2-3 hours and then we have lunch with the staff, which our boss provides for us. Because Tokyo is quite expensive, we have been very selective on what we spend our money on and we often try to do lots of things for free. Our favourite thing to do, is jump on the bikes and just ride through the city. On one of our first nights in Tokyo, we went to the very busy, Shibuya crossing. I’ve wanted to come here ever since I saw that scene on Fast and the Furious. It is exactly like that, full of so many people, minus the cars drifting through the crossing. A lot of figures get thrown out there but I read that around 250,000 people cross there per day. On the fringes of Shinjuku, there is a small place called Golden Gai. Its a collection of small bars connected by 6 alleyways and small pathways. The bars are very tiny and can house up to 5-10 people in each bar, which makes it very intimate with the bartender. The vibe here is so unique that it makes you feel like this is what Tokyo used to be like back in the day. I didn’t even realise till after, but taking photos or videos in this area is prohibited, but Eb and I were shooting away haha. Some of the bars only allow Japanese speakers and others have a cover charge of 1000 Yen ($13 AUD). We entered a bar but left pretty quickly as the prices of drinks were on the expensive side.